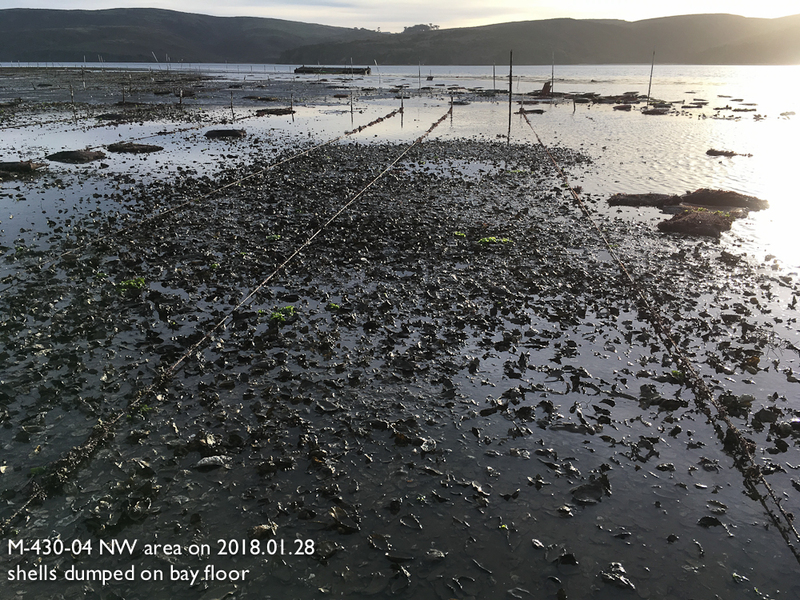 Below you will find an update on my ongoing efforts to protect Tomales Bay from the historically poor practices of shellfish growers, and a long history of virtually no oversight by the California Department of Fish & Wildlife (CDFW) and the California Fish & Game Commission (CFGC). The CFGC leases state water bottoms in California to shellfish growers. Given the shortage of suitable coastline with clean water, you’d think the CFGC would be charging a premium rent (supply and demand). You would be wrong. More on that in a future post. 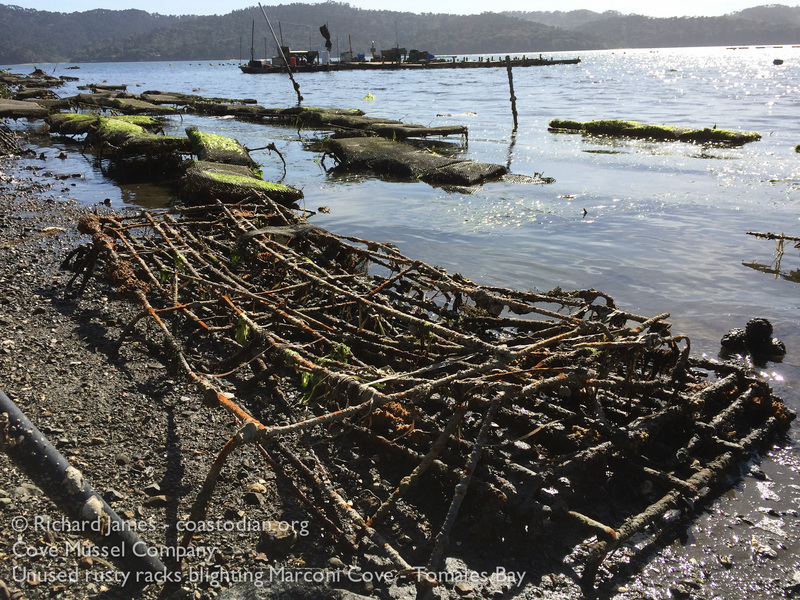 If you care for Tomales Bay and want to protect it, please write the following people and tell them to implement and enforce strong Best Management Practices over shellfish growers. Tell them to fix the woefully inadequate escrow cleanup bond system. And kindly ask them to make a better effort at enforcing existing litter laws and to regularly monitor aquaculture statewide. Our state bays and estuaries are priceless treasures for ALL to enjoy. Responsibly practiced shellfish aquaculture, properly sited, adds value to life in the form of delicious shellfish, jobs and the continuation of a long tradition. Authentic stewardship is paramount to assuring this practice does no harm to the precious bays and estuaries of the ever changing (and rising) sea. 1) Growers need to stop losing so much plastic, wood and other gear. They also need to regularly pick up the debris that they do lose. 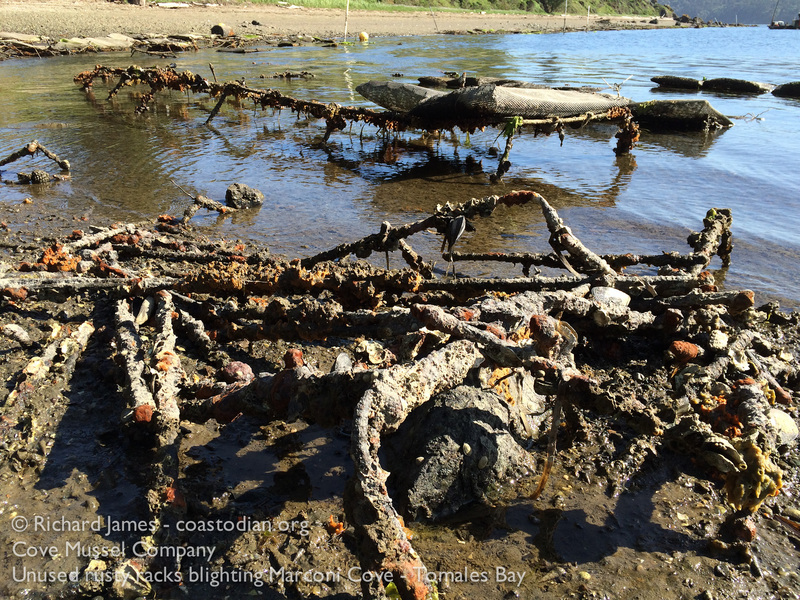 All of the legacy debris left by growers from days gone by needs to be removed from the bay. 2) A. Best Management Practices (BMP) need to be developed and become an enforceable part of being allowed to profit from public trust tidelands. 2) B. The cleanup fund escrow system to address abandoned infrastructure and other damages done to a lease needs to be redone so that it is actually applied, AND is not based on cost estimates made by the growers themselves. 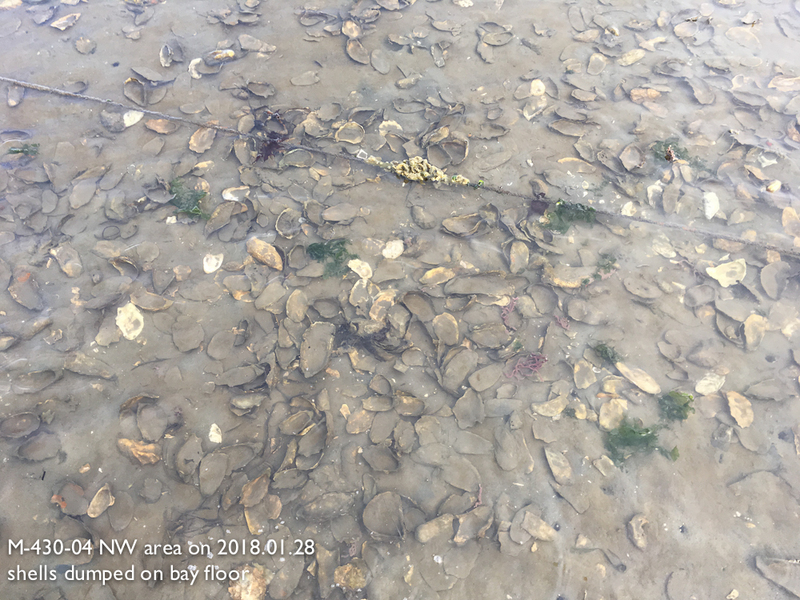 3) CFGC and CDFW need to actually DO their job: regular monitoring of leases, enforce existing laws, ensure growers are not diverting creeks with un-permitted structures or altering the bay-floor by dumping large quantity of oyster shells or other materials into the bay. This is taking place. The growers are losing less gear and making a noticeable effort to pick up that gear still getting loose. There is still room for improvement, as bags and other culturing devices are still getting loose. But overall, a vast improvement! 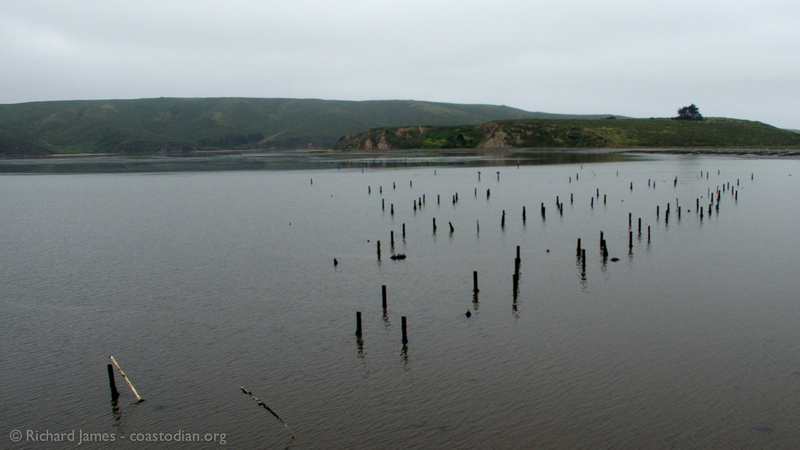 Unfortunately, much of the legacy debris continues to blight the beauty of Tomales Bay. You can see what I am talking about here. 2-A Best Management Practices (BMP) need to be developed and become an enforceable part of being allowed to profit from public trust tidelands. On April 8, 2015 (1087 days ago and counting), a proposed list of BMP that I drafted were delivered to the CFGC at their commission meeting in Santa Rosa. The growers and numerous agencies have mulled over and massaged this list since then. The latest revision put forth by the CFGC is very close to what I originally proposed, except it does not include that growers must mark all their gear with their name & phone number. Marking all gear is important in order to ensure growers practice authentic stewardship. My most recent iteration of what I think are good common sense BMP are below. These BMPs shall be an integral part of each lease. 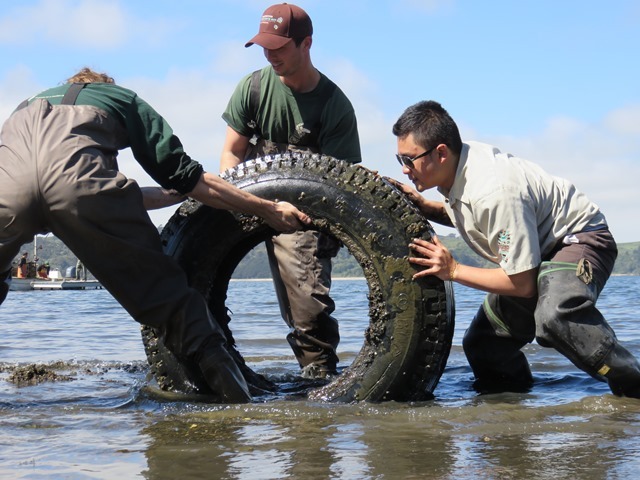 The practices shall be mandatory practices meant to ensure Tomales Bay and the ocean in general is kept free of lost plastic and other debris from aquaculture operations. 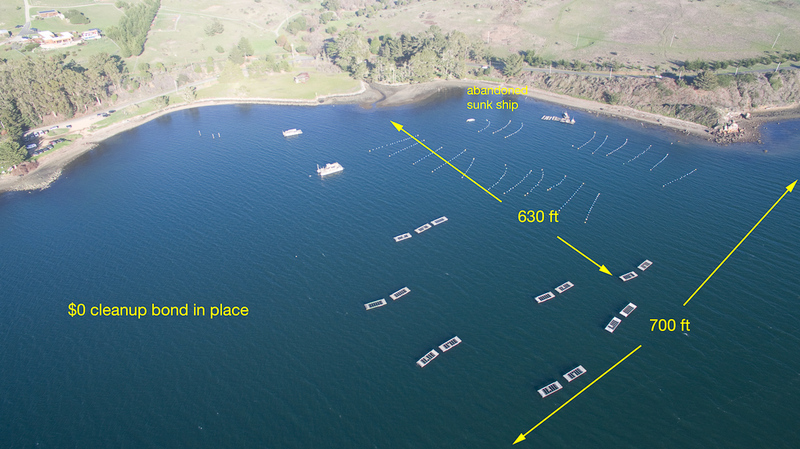 To have the intended effect of reducing litter in Tomales Bay attributed to aquaculture, it is imperative that these practices be adequately and regularly enforced. Harming the environment is a criminal matter, not an administrative matter. Growers shall train all employees in concepts of Leave No Trace, see http://LNT.org, or similar training about environmental stewardship. Growers shall continually improve gear and methods in a quest to lose less gear. Growers shall replace single use items (i.e. zip-ties, copper wires) with more durable items such as stainless halibut clips. Growers shall NOT use floats that are easily degraded by sunlight or pecked by birds in search of food. Growers shall securely tie large groups of non-floating bags together when deploying bags for future securing to anchor lines to ensure they do not drift. Growers shall remove all tools and materials each day after working on lease areas, including: fencepost drivers, gloves, water bottles, PVC pipes, wires, and ropes. Work barges shall be secured to ensure items are not blown into the bay. Growers shall NOT dump shells, lumber, bags or other debris on the bay floor to walk upon or for any reason. Growers shall promptly (within 90 days) remove culture structures and other items comprising a method that did not work as desired or is no longer used. 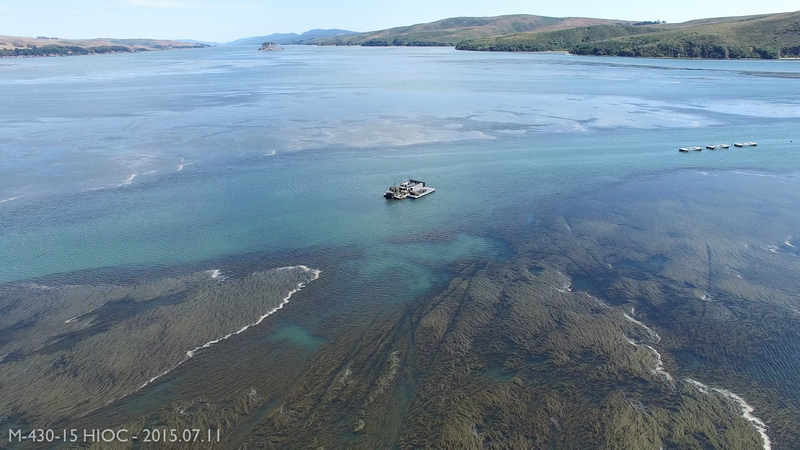 Growers shall patrol lease areas and the shores of Tomales Bay on a monthly basis, twice monthly during windy or heavy surf times. 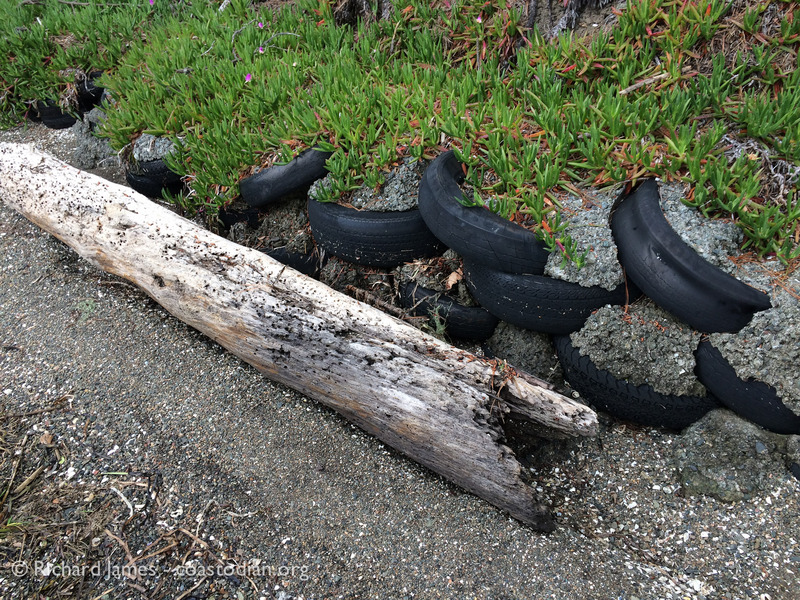 Patrols must occur at both high and low tides to ensure gear buried in the mud is promptly collected. Growers shall uniquely and clearly identify all of their boats and barges. Boats should be clearly identifiable with binoculars from a distance of 1 mile. Unique color, large letter and/or number or combinations of these may work. To support item 11 above, the below images show some of the boats used by various growers. Notice how many of the boats look identical. Also shown is one suggested ID method to allow distant observers to know which grower a particular boat belongs to. Also, how many of these boats are properly licensed? The reason for my concern centers on the damage done to the eel grass beds on or near the leases. 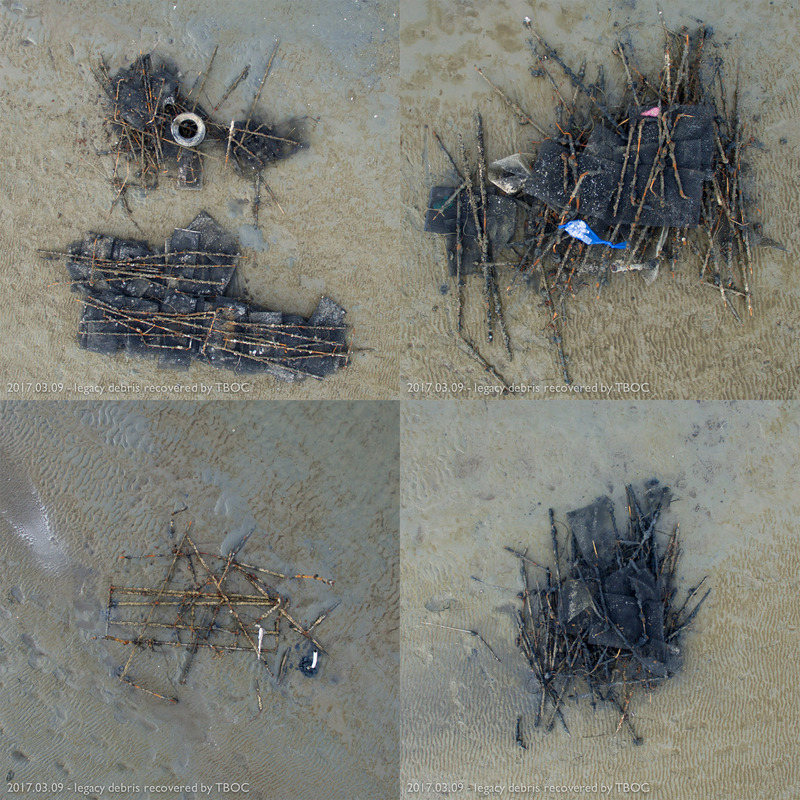 Below are three images recorded from overhead, showing deep and permanent damage done to the eel grass by the propellers of boats accessing the lease areas. On numerous occasions I have witnessed oyster boats operating at low tides, attempting to access areas of the bay not deep enough to access without driving the prop of the boat into the bottom of the bay, destroying everything that the prop meets, like a blender, loudly throwing a tall, brown rooster-tail into the air, easily visible/audible from a mile+ away. If boats were clearly labeled, interested stakeholders would be able to give the Commission/Department accurate information with which to hopefully take action. The below images show the reasoning behind item 8. 2-B The cleanup fund escrow system to address abandoned infrastructure needs to be redone so that it is actually applied, AND is not based on cost estimates made by the growers themselves. The figure below (from K. Ramey files acquired via Public Records Access [PRA]) shows how much has been contributed (allegedly) by each grower. 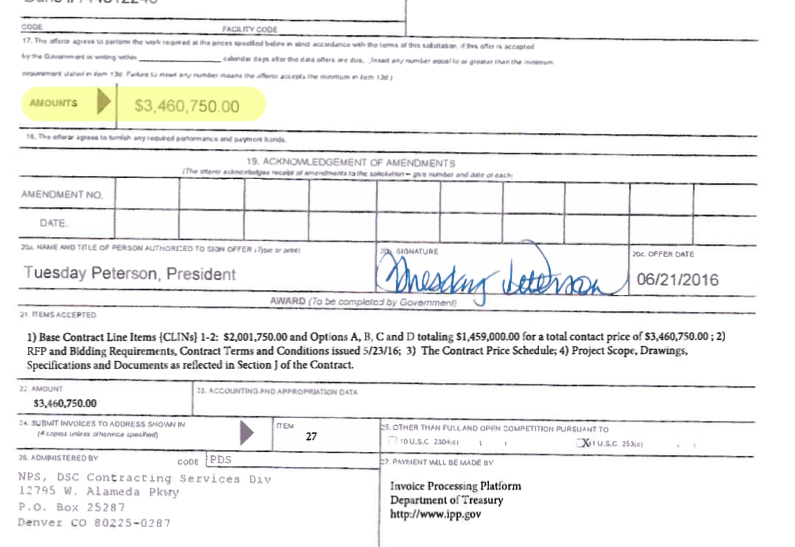 Total on account (allegedly) is $106,255. Below is an image showing part of the main contract paid by the NPS for the cleanup of aquaculture debris left by DBOC in Drakes Estero. This is not the entire sum. Beyond the $3,460,750 shown below were other substantial fees associated with the removal of oysters and clams left by DBOC. Below are images of some current leases, showing rough dimensions as well as the amount paid into the escrow fund. These values are self-assessed cost estimates provided by the growers. Have you ever been asked by a landlord how much of a cleaning deposit you think you ought to pay? This request needs no further support. 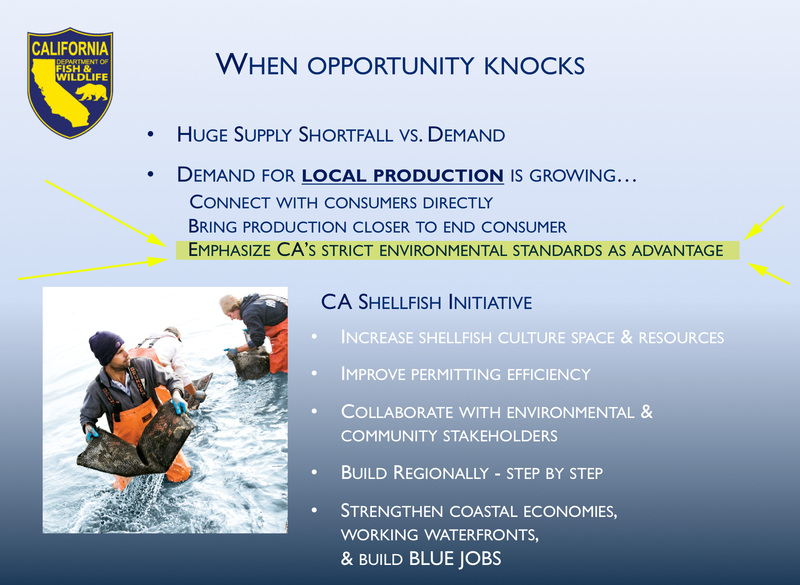 The slide seen below was created by the State Aquaculture Coordinator. How can one have an advantage based on strict standards if the laws those standards are based on are not enforced? 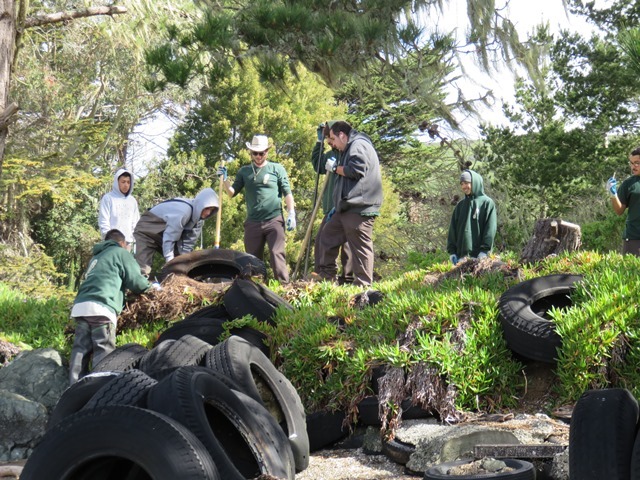 Respect Tomales Bay – TBOC makes a huge effort, cleaning up legacy trash left by others. 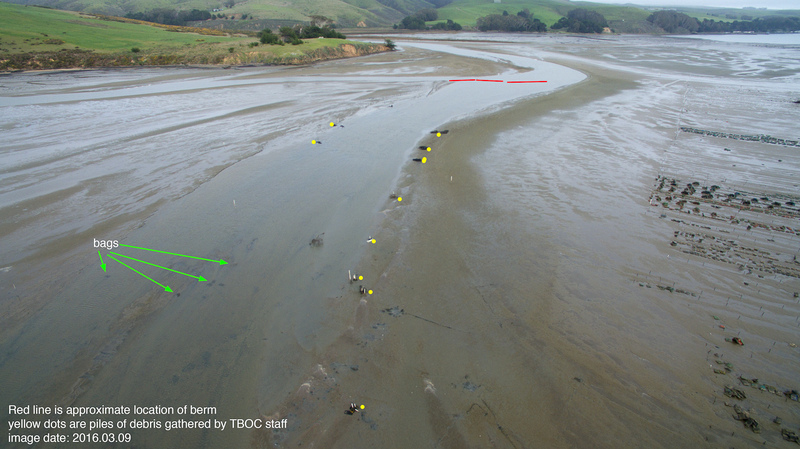 Click on the words above “Respect Tomales Bay – TBOC makes a huge effort…” to see this entire post. Ten days ago while walking the mudflats at the mouth of Walker Creek I came across a most interesting find. 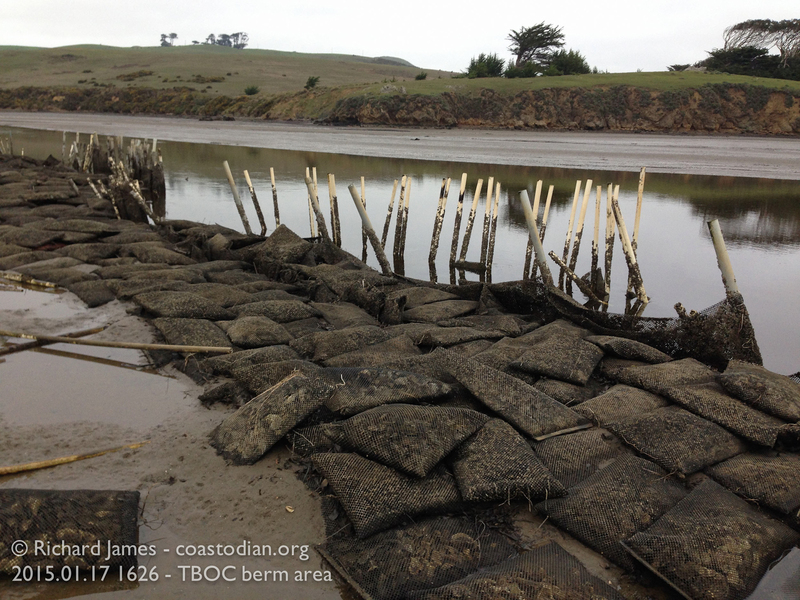 A large amount of abandoned oyster racks and grow out bags. Well, let me tell you what is so interesting about this particular find. As you may know by now, a series of unpermitted fences meant to redirect the flow of Walker Creek have blighted The Bay for upwards of 15 years. You can read about these structures here, here, here and here for starters. Here are two images showing one such fence before removal, as it was on 17 January, 2015. 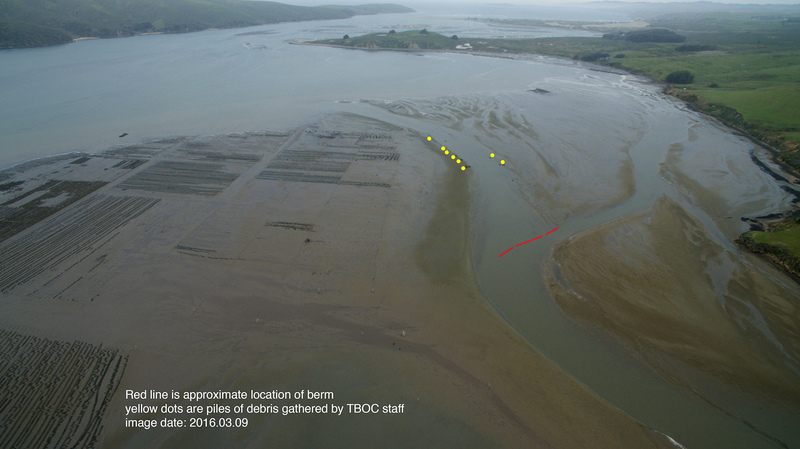 Now removed Walker Creek diverting pile of plastic and oyster shells. Those fences were removed last year before an epic series of storms graced the area with much needed rain, rain that made its way down Walker Creek with a full head of steam. Instead of being shunted to the north by a wall of plastic bags, PVC pipes, concrete pilings, plastic-coated copper wire and zip-ties – all that lovely water was once again allowed to run freely. 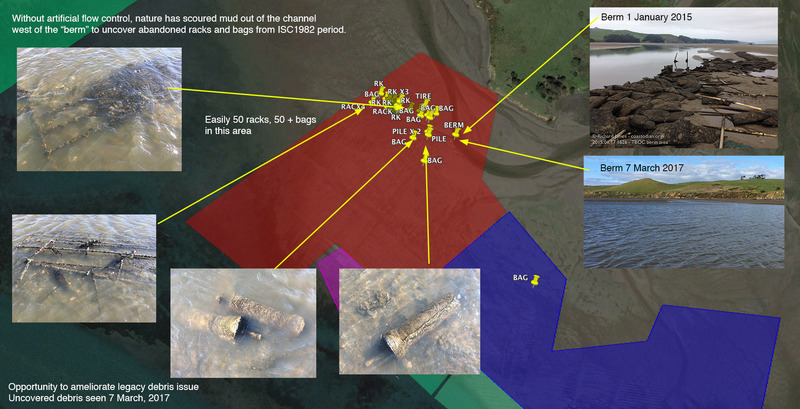 The huge volume of water that poured naturally through what had for 15 or more years been a mudflat uncovered an enormous amount of abandoned iron racks and plastic bags (many filled with dead non-native oysters). This debris was left there after the 1982 epic flood that buried much, if not all of the oysters being farmed by International Shellfish Corporation. Of course I made photographs and recorded Lat/Lon waypoints of this find. I shared this information with all the current growers (including TBOC, on whose lease this legacy debris had remained hidden all these years), as well as some of the alphabet soup of agencies responsible for caring for the precious coastline – CFGC, CFDW, CCC amongst them. 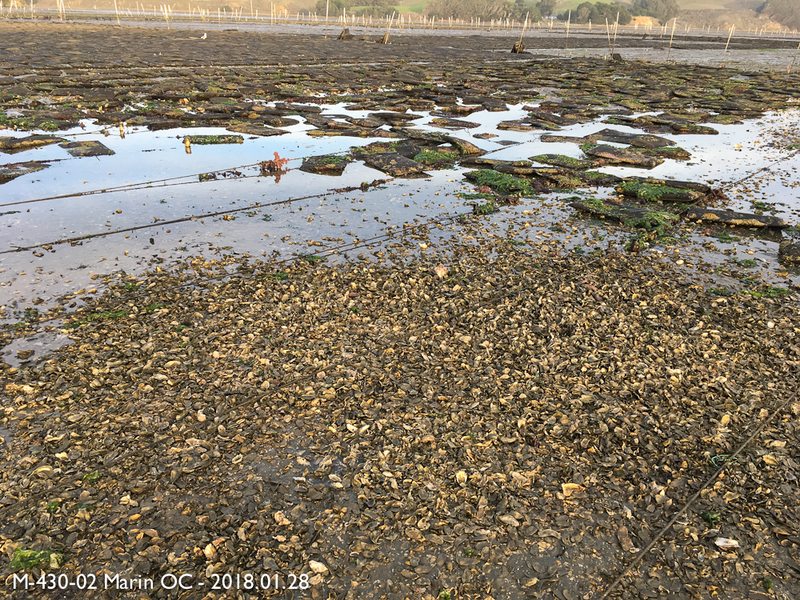 Unable to lift out this mess myself due to an injured back (from lifting non-oyster farming debris out of the bay a month prior), I gave this information to the growers and agencies and hoped that someone would take the ball and run, before the tides once again covered it back up. The next day, most, if not all of the TBOC crew was onsite pulling this gear out of the mud, piling it along the newly formed channel. How awesome is that! A big thank you to TBOC for stepping up to remove gear that was on public land which they lease, though not their gear. They recovered 223 bags, some still with dated tags from 1980 on them, as well as many hundreds of pounds of sharp, rusty iron racks. Let’s hope other growers on the bay follow this lead and remove legacy gear from public land they now lease, littered with gear from years ago. Ideally the agencies tasked with regulating aquaculture on public lands will pitch in to help current growers deal with messes left by those that came before them. Debris recovered and removed by TBOC! 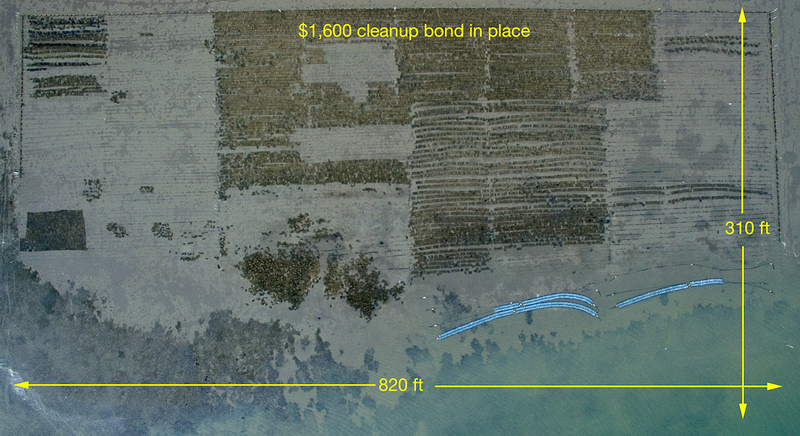 Image showing location where legacy debris was removed by TBOC staff. Red line shows location of former unpermitted creek-deflecting berm. Removing the vast amount of Oyster Farming Legacy (OFL – rhymes with awful) is not as simple as heading out and picking up this stuff. 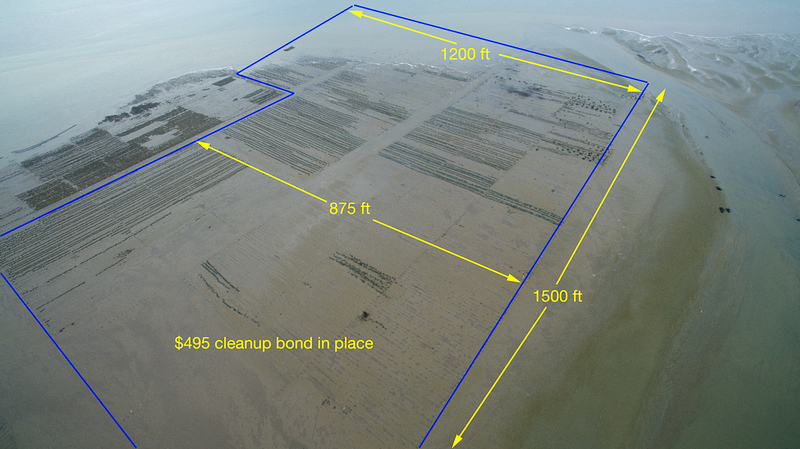 Some permits are needed in order to do needed cleanup work in the coastal zone. Permits that TBOC had in hand to effect the (almost) complete removal of the last of their creek-deflecting structures. What must now happen is for the Fish & Game Commission and Department of Fish & Wildlife to step up and take responsibility for their growers of days gone by (some under their watch, some before their watch began) and do the necessary leg work to secure permits for the removal of the remaining OFL blighting Tomales Bay, as well as make the removal happen. Growing shellfish along the coast is OK by me, as long as it is done truly sustainably, by those practicing Authentic Stewardship. Now more than ever we need to protect the environment. Undoing the damages from past practices, as well as incorporating Best Management Proactices (BMPs) into leases and redesigning the cleanup fund escrow system to remove the numerous conflict of interest issues, as well as to give it teeth make good sense. 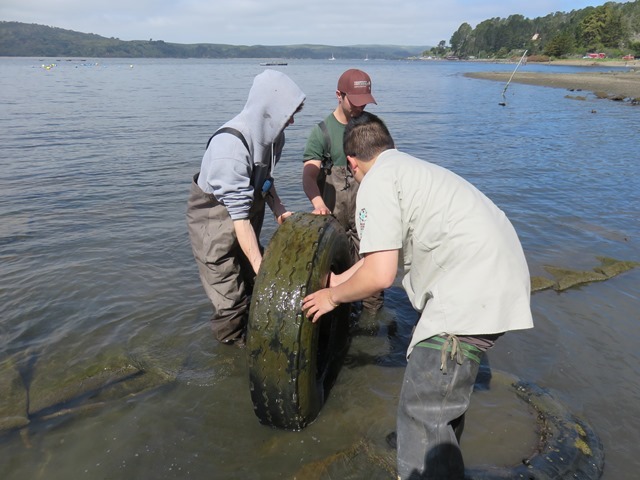 This is especially important in light of the new application to practice aquaculture in Tomales Bay that has been recently submitted. 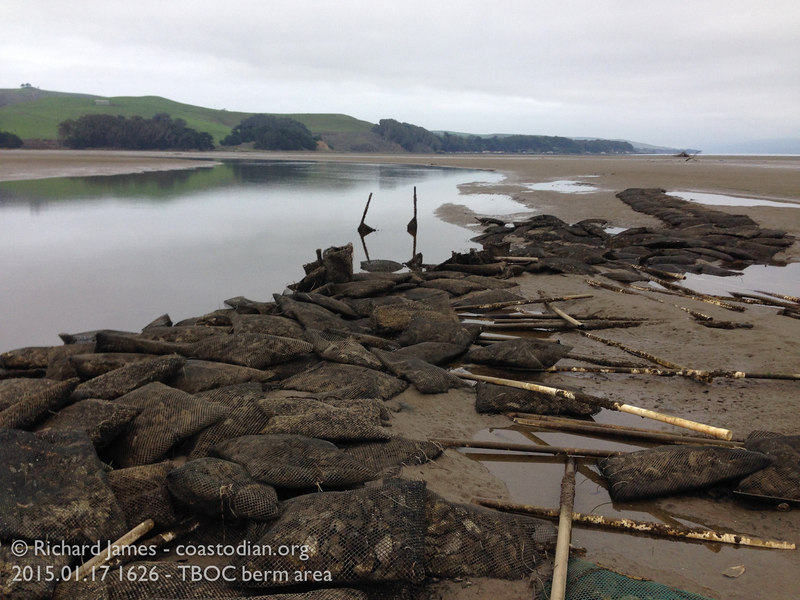 Below are images showing some of the debris still left all around Tomales Bay by growers of yesteryear needing to be removed by Authentic Stewards. 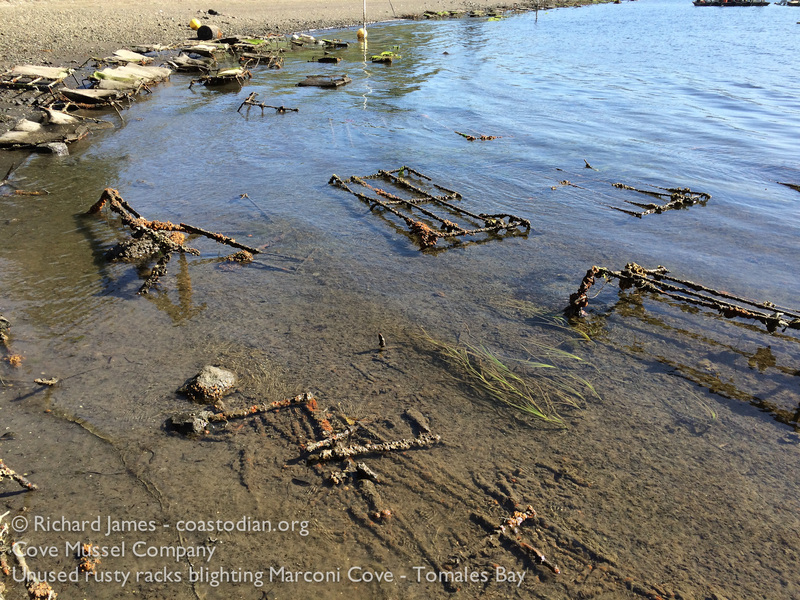 Some of the many dozens of sharp, rusty iron racks littering Tomales Bay, presenting a danger to all who boat there. Four telephone-sized treated pilings and ten or so sharp rusty racks, all abandoned in The Bay long ago. 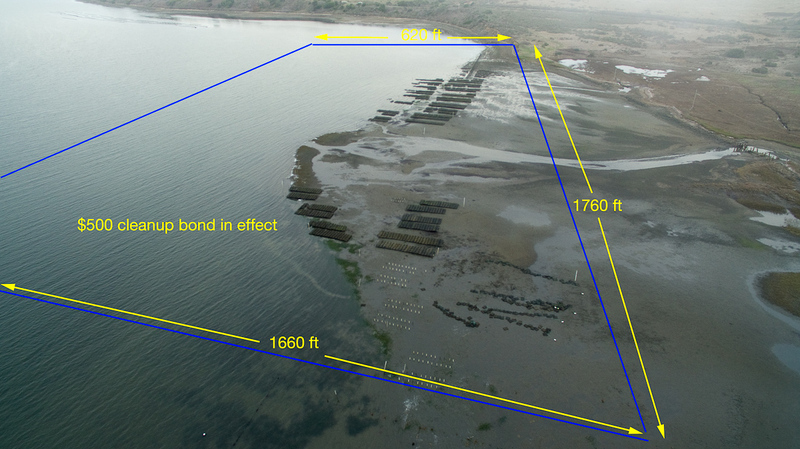 140+ treated pilings abandoned long ago near Tom’s Point. 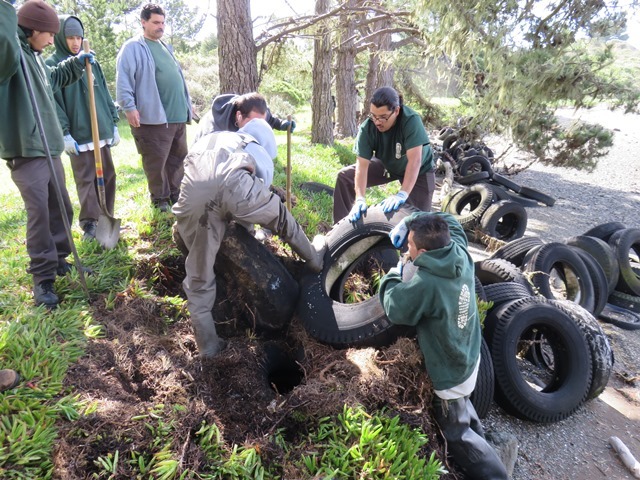 Respect Tomales Bay – Conservation Corps North Bay Cleans Up Marconi Cove! 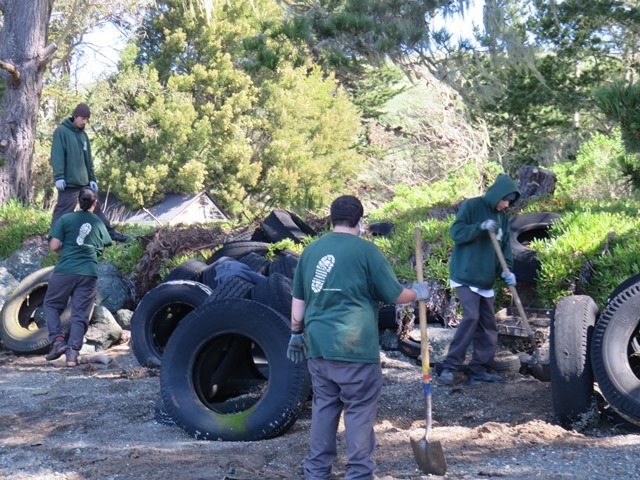 Click the words above “Respect Tomales Bay – Conservation Corps North Bay…” to see this entire post. A couple years ago while boating on Tomales Bay, I came across what I learned is called Marconi Cove. It is state owned property that has been “left to rot” for some time now, large debris littering the place. 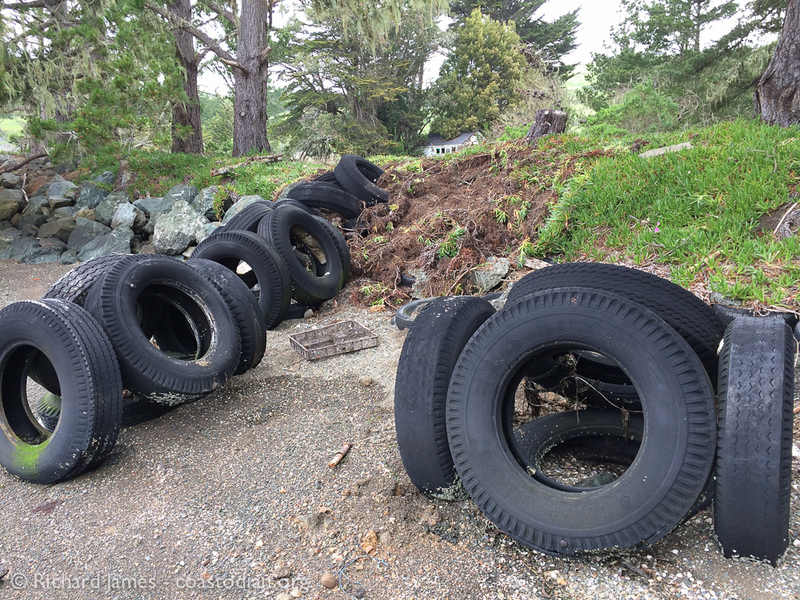 A former gas station occupies the property along with much other debris that really shouldn’t be wasting away and spoiling Tomales Bay. 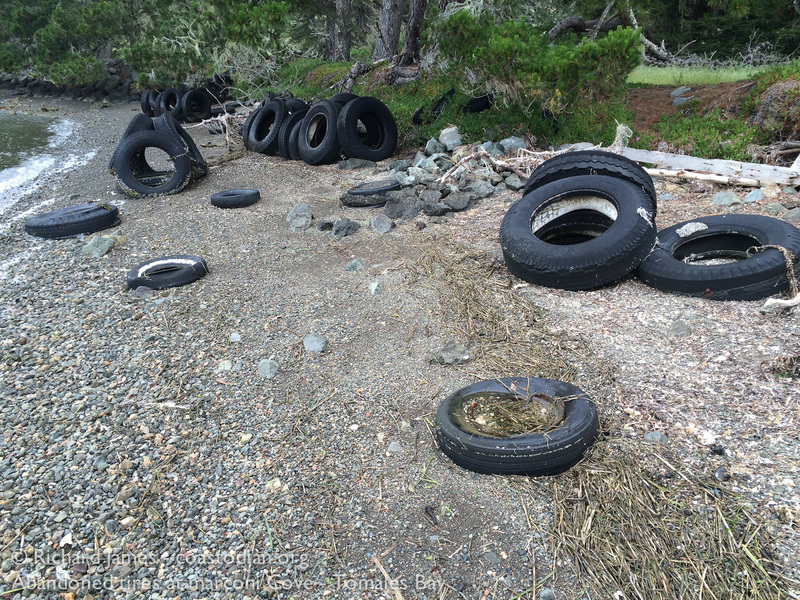 The good news is that nearly one hundred large truck tires have been hauled away. 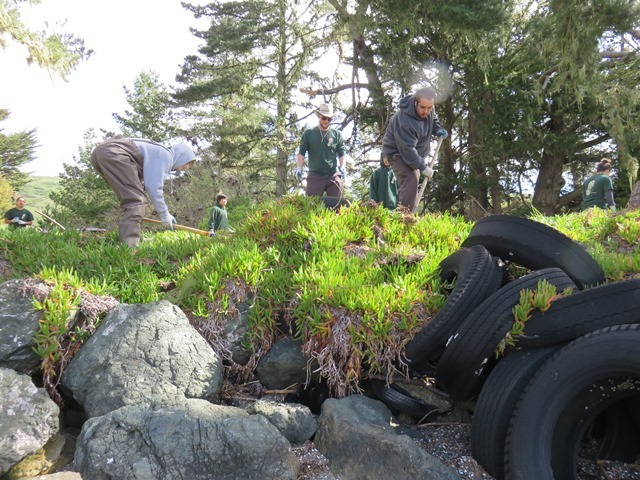 Brandon Benton and his crew of hard working youth at the North Bay Conservation Corps learned of this mess from Dale Dualin at NPS-Point Reyes Seashore. Over a few weeks, Brandon and crew dis-assembled and hauled off the mess you see in the following images. A big shout out to both Brandon and Dale – Thanks guys! 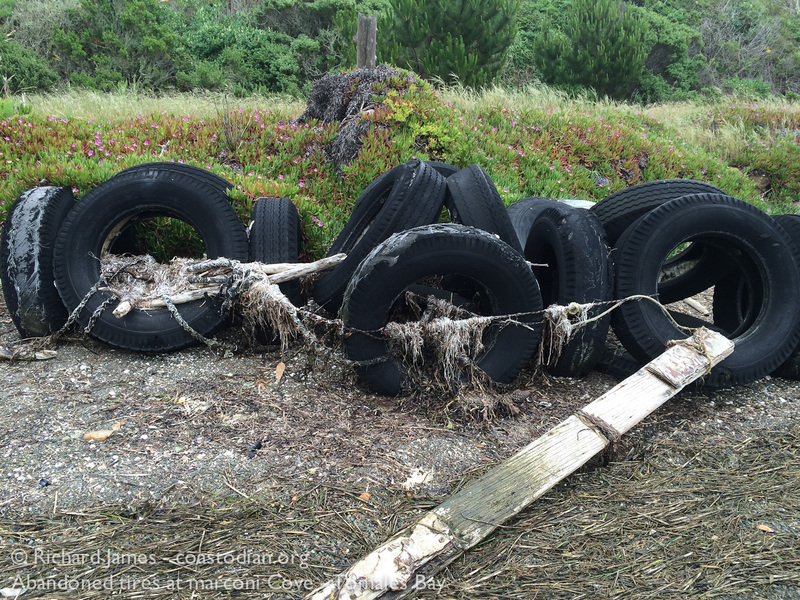 Marconi Cove – Tomales Bay – Without so many tires spoiling the view! 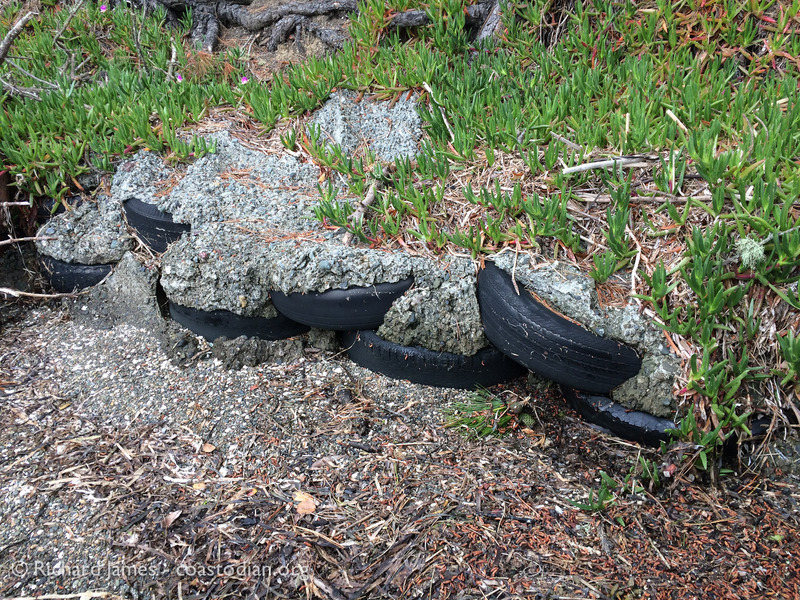 There are still well over a hundred tires cemented into a wall (what were they thinking????) that need to be removed. That is a project for another day. 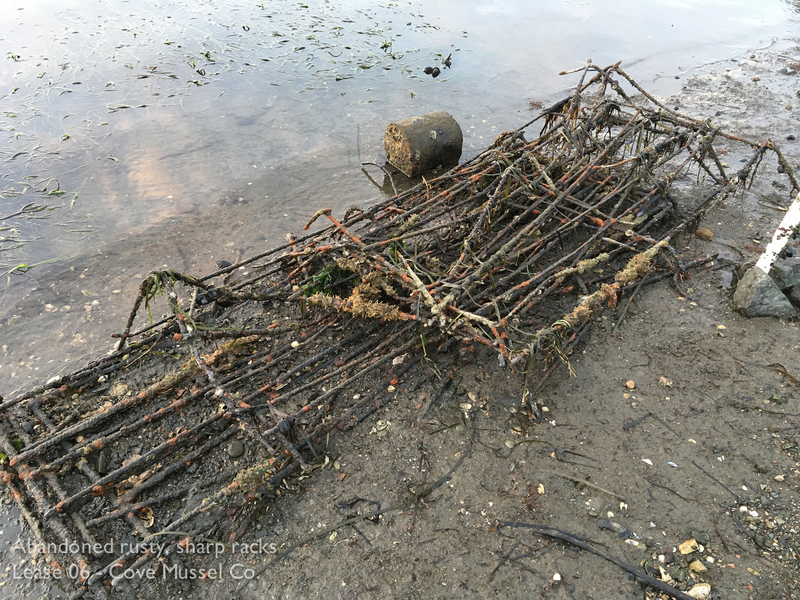 Now, if only we can get the folks at Cove Mussel Company to clean up their dilapidated, unused oyster racks and other mess…. 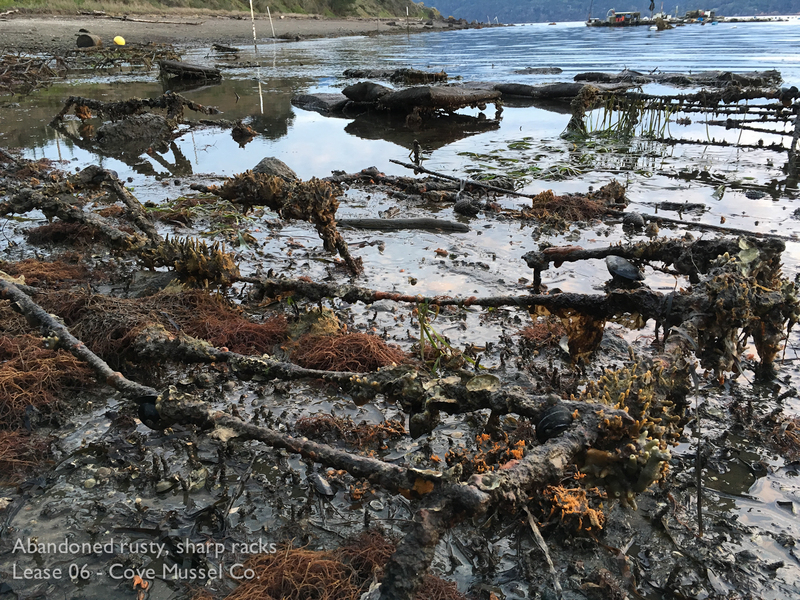 UPDATE: The folks at Cove Mussel Company have made a huge effort in cleaning up their unused equipment. Mos all of what is shown below has been cleaned up. Thank you Cove Mussel Company! 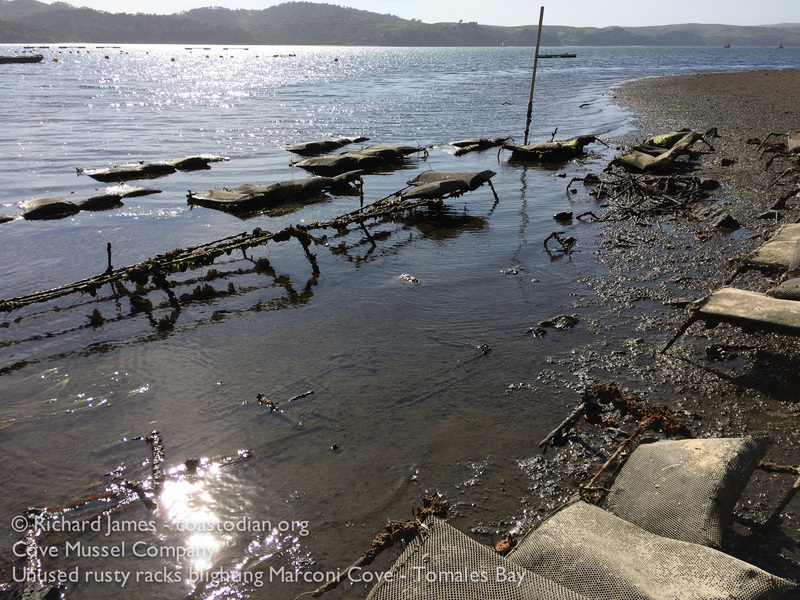 See the first post in this series “Respect our Tomales Bay” here. 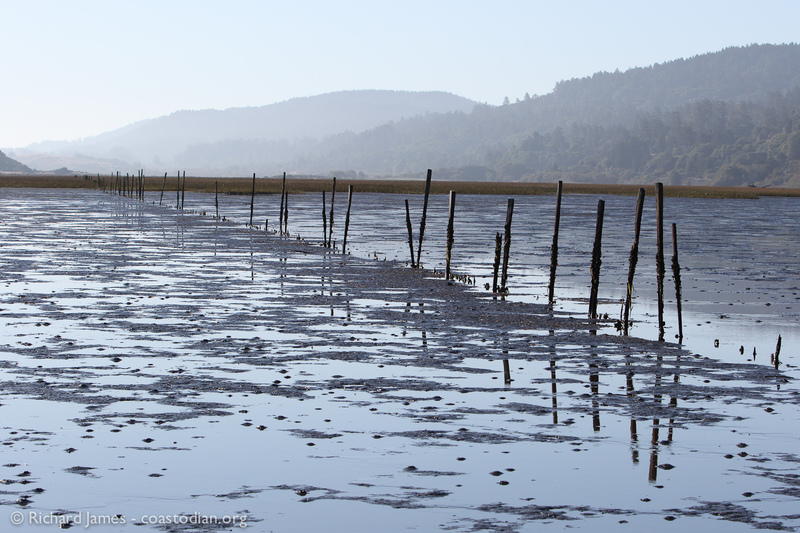 Oyster farming in Tomales Bay has been taking place for well over one hundred years. 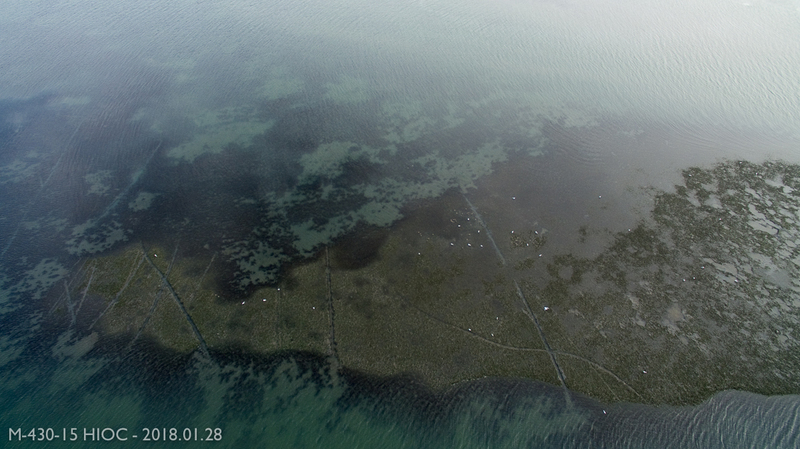 The nature of farming oysters means it is often done in hard to get to places, where common citizens seldom venture. 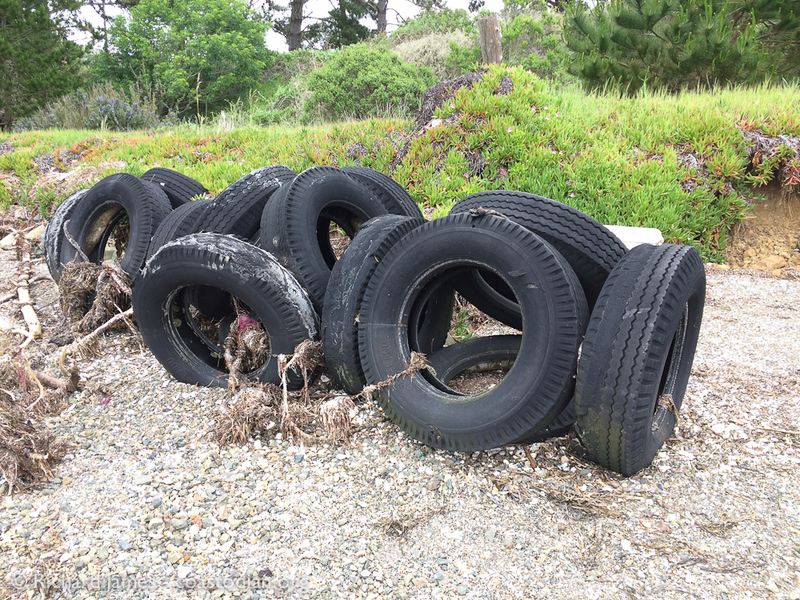 During this lengthy time, a variety of growers with varying levels of respect for the environment, and poor to no oversight by the agencies tasked with protecting the coastal waters have left a legacy of trash throughout Tomales Bay that few people know is out there. Look here to see the many messes I speak of. In the coming months, a number of oyster growing leases are up for renewal. It is critical that these leases, written decades ago, be updated to include Best Management Practices and that the loopholes in cleanup escrow accounts be closed so that each lease is clear on how Tomales Bay is to be cared for and the escrow funds can and will be used if need be for cleanup as intended. These requests are not critical of Hog Island Oyster growing practices (whose lease is up for renewal at the 9-10 December CFGC meeting) and are intended as improvements to all leases for all growers. Hog Island is an exceptional grower that works hard to minimize lost gear and reduce the negative impacts of oyster growing on Tomales Bay. We want ALL growers held to the same improved standards and request that all future leases and lease renewals include the following language. 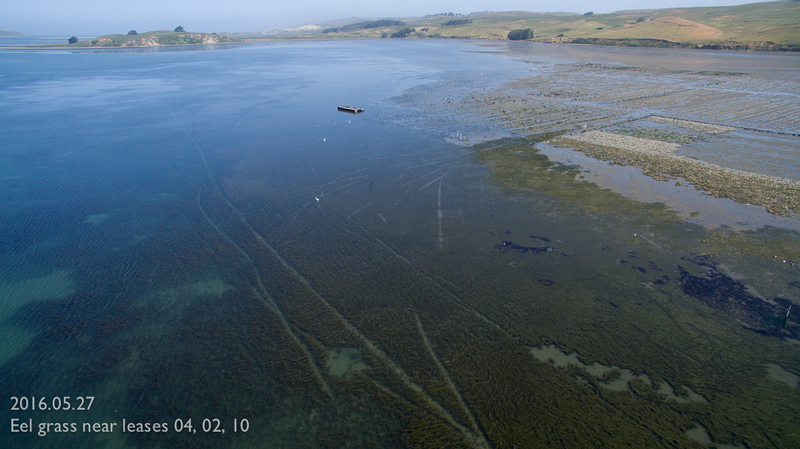 Tomales Bay deserves improved protection from all oyster growers. We also want the Fish & Game Commission and Department of Fish & Wildlife to use their role as “landlord” and “law enforcer” more effectively. Updating the lease language is a good first step and shows they intend to represent the best interests of the people of California. If California is to have one agency that both promotes oyster farming, as well as protects nature from oyster farming, that agency needs to take more seriously the protection part of their mission. Lease M-430-15 held by Hog Island Oyster Company is up for renewal at the California Fish & Game Commission (CFGC) meeting in San Diego on 9-10 December. Please write the Executive Director of the CFGC and request that all new leases include the Best Management Practices described here and that loopholes concerning the cleanup escrow account be closed. Please write this individual now! He needs to hear from you before these meetings. Director Mastrup, please include the following Best Management practices in all new leases, sub-lease agreements and lease renewals. Collected abandoned gear must have an easily known owner so that habitual litterers may be dealt with individually. To identify gear, growers must use unique bag colors and unique copper wire colors. One person that does nothing but litter patrol and cleanup. A second rotating position so that all employees see the issues and learn to reduce litter during daily operations. Conduct yearly meetings with third party monitor(s) to learn what is working, what is not. If copper wire is used, each grower has assigned colors. Growers will recover all copper wire once bags are collected at harvest. Floats must be durable and resistant to pecking by birds. Floats must be securely attached to the oyster bag. All bags must be securely connected in a string to prevent drifting and loss during the time between mass deployment and being tied to anchor lines. Prohibit leaving of tools and materials leases, inter-tidal areas, and all nearby areas. Growers must remove all uninstalled PVC pipes, gloves, zip-ties, copper wire, ropes, hay hooks, bags and water bottles from lease areas each day. If a growing idea does not work, remove it promptly within 30 days. 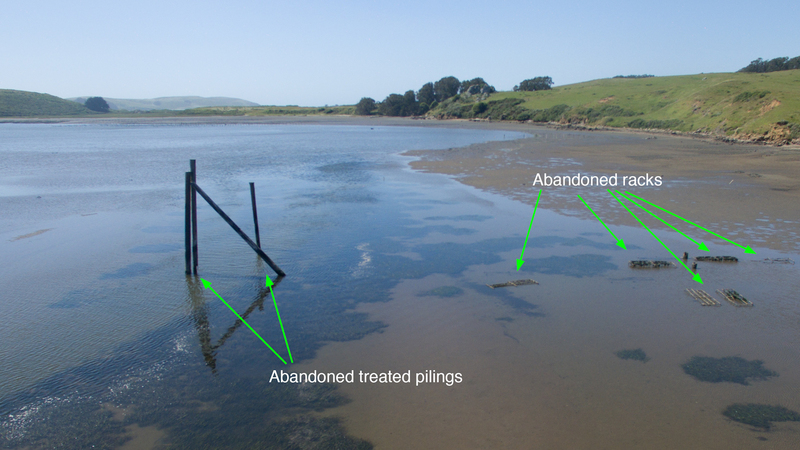 Abandoned pilings, posts, PVC, machinery and other debris left in and around Tomales Bay are no longer allowed. Patrols will be increased to twice a month during high winds or storm events. 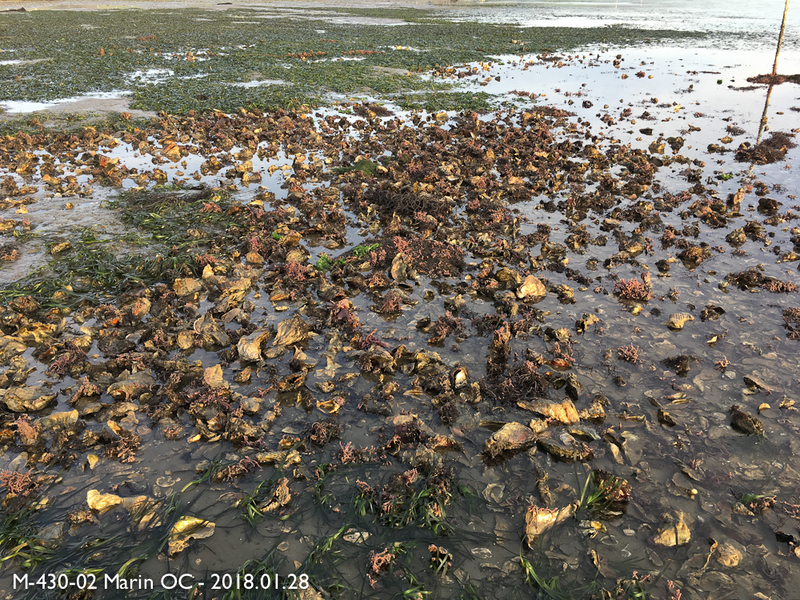 Effective patrols must include walking shorelines and wetlands, and kayaks or other craft should be used for hard-to-reach areas to avoid damaging eelgrass with propellers. 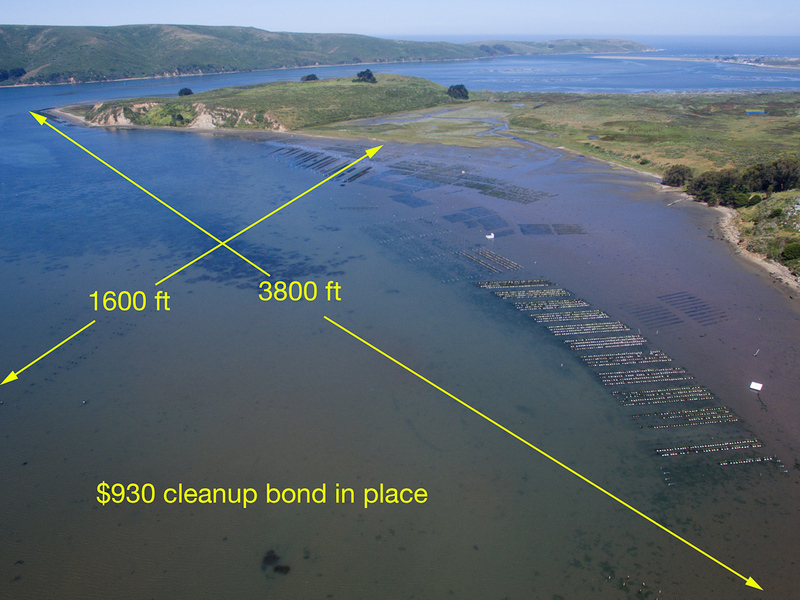 Director Mastrup, please have third party, objective cleanup estiamtes done to determine the actual cleanup cost of all infrastructure used by oyster growers in ALL growing areas of California (Tomales Bay, Morro Bay, Humboldt Bay etc.). The Commission has made promises to address this since April, yet nothing has been communicated to interested parties on any progress in this very important matter. 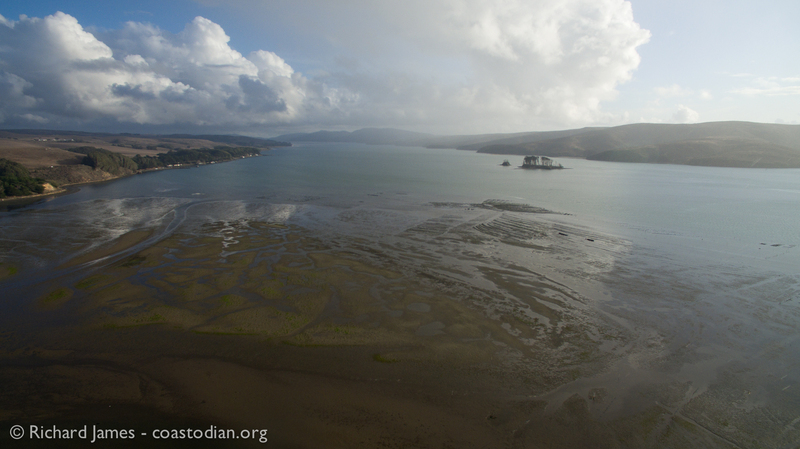 Tomales Bay deserves strong protection so that future generations can enjoy this jewel.